Haddock fillets seem like they were made for deep-frying. 2 Can I Fry Tilapia Without Batter? 3 How Do I Pan Fry Fresh Fish With a Little Oil and Cornmeal? Few other whitefish match the sustainability and versatility of haddock. 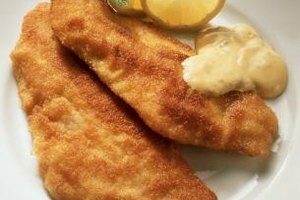 Mainly farmed and wild-caught in New England, haddock works with the same cooking methods as cod and tilapia -- poaching, smoking, grilling and roasting -- but restaurants usually deep-fry it for fish and chips because of its low cost, mild taste and flaky texture. Haddock is prolific, also. You find it fresh year-round in the Northeastern U.S., and it's a freezer staple in grocery stores. Haddock's leanness and size make it a good choice for pub-style fish and chips, which you can make at home without any special equipment. Set up a work station for breading the haddock. Pour 1/2-inch of all-purpose flour in an even layer on a plate. Set a bowl of egg wash -- whole eggs beaten with a touch of cream or milk -- beside the plate of flour. Place a shallow dish containing 1/2 inch of panko breadcrumbs beside the egg wash. Setting up the ingredients in the order used when breading the haddock makes prepping them for frying easier and faster. Fill a deep, heavy-bottomed pot with 3 or 4 inches of high-temperature oil, but no more than half-full. Peanut, canola and sunflower oil all have smoke points greater than 350 degrees Fahrenheit, or the temperature needed for deep-frying breaded fish. Heat the oil on the stove over medium-high heat for about 10 minutes. Remove the haddock fillets from the refrigerator while the oil gets hot. Pat the haddock fillets dry with paper towels and season them to taste on both sides. Insert a meat thermometer in the center of the oil and check the temperature. Adjust the heat higher or lower as needed so the oil stays between 350 and 375 degrees. Dredge both sides of each piece of haddock in the flour and dip them in egg wash. Lay the haddock fillets in the breadcrumbs and gently press them with your fingers. Turn the haddock fillets over and press the other side into the breadcrumbs. Place the breaded haddock fillets on a plate. Lower the haddock fillets one at a time into the oil with a slotted spoon or tongs. Don't overcrowd the oil; add just enough fish at one time so the fillets have an inch or two of space on all sides. Deep-fry the haddock fillets until they float and have a golden-brown crust, about three or four minutes. Remove the fillets one at a time with tongs or a slotted spoon and place them on a plate or tray lined with paper towels. Blot each fillet on top with a paper towel. Gentle blotting done right after frying makes the crust crispier and less oily. Continue frying the haddock fillets in batches, allowing the oil to return to between 350 and 375 degrees between each batch. You can substitute regular breadcrumbs if you don't have panko breadcrumbs. Panko breadcrumbs, however, produce a lighter, crispier and airier crust than regular breadcrumbs. Strain the oil through a sieve lined with cheesecloth after it cools to room temperature. 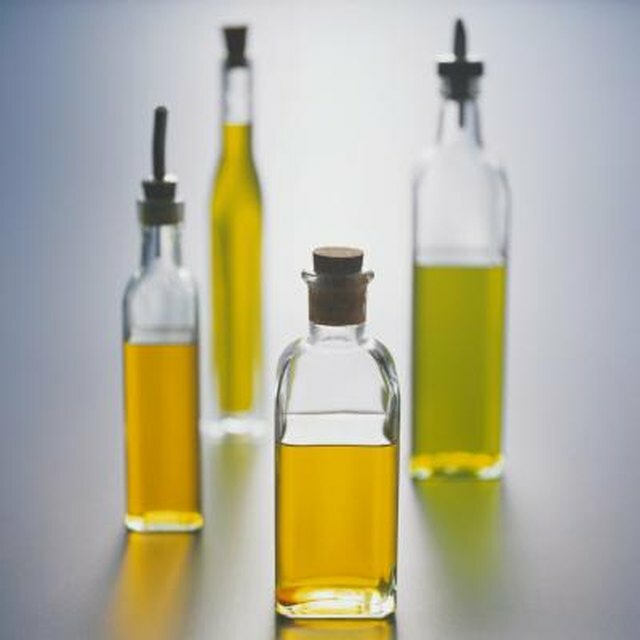 Store the oil in an airtight food storage container for reuse for up to one month.